Want to create an original look without compromising on elegance? Look no further than this unique combo spotted at London Fashion Week for a color-pop style that is perfectly balanced. 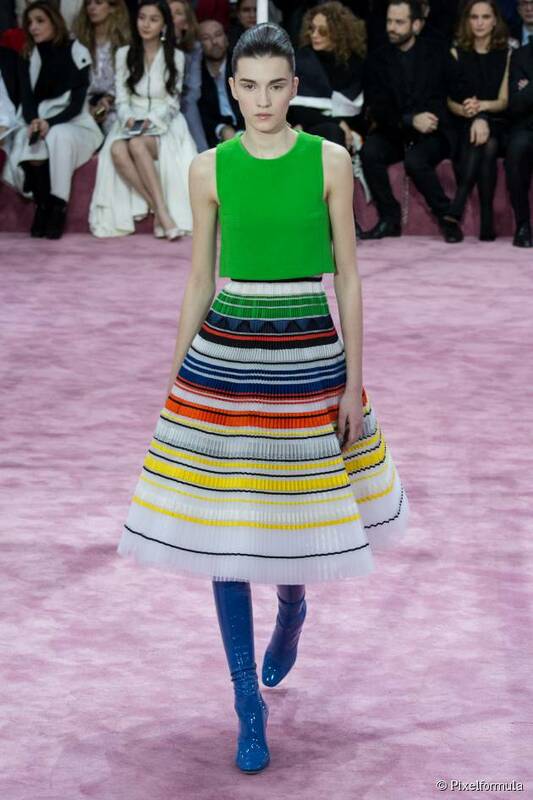 This look was spotted on the Christian Dior haute couture Spring-Summer 2015 runway show. Models wore long hair, secured into asleek ponytail. A subtle backcombed section at the crown was added for extra height which helped open up the models faces and create a very sophisticated feel. Who can wear the trend? Take direct inspiration from the runway and pair this laid-back style with a bolder outfit choice! This is the ideal opportunity to dig out any colorful, printed pieces you've been dying to wear all summer. In terms of your actual outfit, bold is the key word. What's more, having your hair away from your face means a statement make-up look is perfect for showing off your features. Start by washing hair with Hydration and Suppleness shampoo from the Oil Therapy range. Your aim is to deeply nourish and boost shine! Dry then detangle carefully. Next, rub a small amount of Design Gel between your palms and apply to the roots. Brush towards the rear, then create a sleek ponytail. Complete your look with a veil of hairspray for a long-lasting hold.